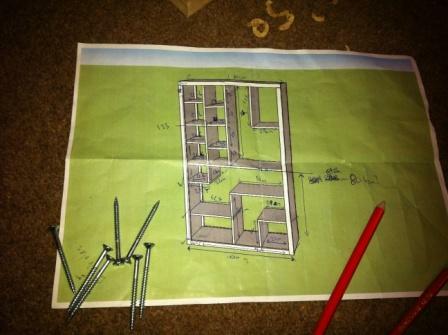 Home - Louie’s very own DIY project – Success or disaster? Louie’s very own DIY project – Success or disaster? 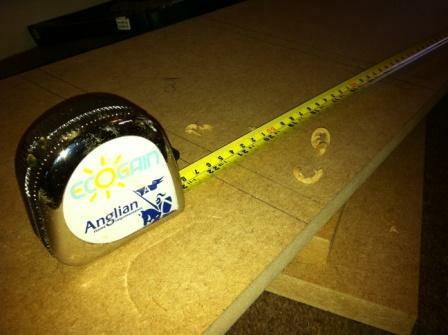 If you are regular readers of the blog you will know that everyone at Anglian loves to read about or do a bit of DIY, but you may also know I am not the best at it, in fact I would go as far as to say I am rubbish! However, there is nothing better than learning, so my friend and work colleague, Kirk (the guy who worked at the Olympics) kindly said he would help me with a shelving unit. We came up with the idea and Kirk drew up the plans; it is quite complicated and something neither of us has ever attempted to make before. Having just moved into a new house, we don’t have much furniture and are in desperate need of shelf space for DVDs, CDs and ornaments. 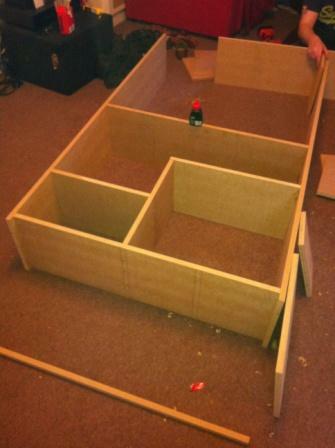 We decided to keep costs down and because it was our first attempt we would use some thick MDF to make it. I didn’t want to spend a fortune on pine only to mess it up. So after a trip to B&Q for some MDF, with all the measurements checked and ready to be cut to size. I wanted to try and do as much of this myself, so we had the MDF cut into the correct width, lengths and I would cut it to size at home with the jigsaw. One thing to note when cutting MDF; wear a breathing mask as MDF dust is quite nasty and over prolonged periods of inhaling the dust without a mask, it can cause health issues. 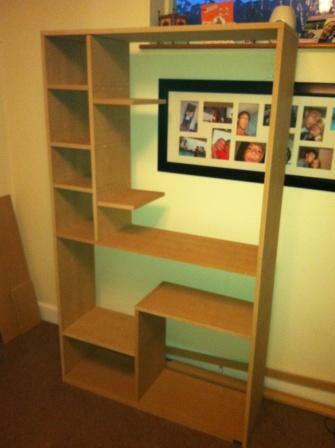 The next step was to drill the holes for all of the screws before we begin to assemble it. Everything was running smoothly and the shelving unit was taking shape; there were a few pieces that didn’t have the straightest edge (my unsteady hand) as we cut the lengths with a manual jigsaw, but apart from that it was looking good! I got some wood filler to make sure I can fill in any gaps and to smooth over the holes made by the screws. The plan is to paint it in a shabby chic style as it is very fashionable at the moment. So after a full Saturday spent measuring, sawing, drilling, screwing and sanding this is the stage I am at. There are still a few more parts to be screwed on; for example there are 3 shelves missing, but it is nearly built and I am chuffed with how it is turning out! Maybe I’m not too bad at DIY after all? Either that or Kirk is a very good mentor. Keep an eye out for the next instalment of my DIY project.